I don't have a burning ambition to make money from my blog. I do have a burning ambition to have a successful blog, one that finds people interested in children's literacy, literature and learning. I particularly want to reach out to parents, librarians and teachers who might find my articles useful. So, on odd occasions between researching and writing, I attempt some of the tasks recommended by blogging gurus to make my blog grow and be successful. But when I get to acronyms like SEO and SERP, when I come across terms like longtail keywords and meta tags, I find my eyes glaze over and I give up. 1. You complete a questionnaire so I can assess your goals for your blog, your skill set and available blogging time. 2. I will analyse your blog, focusing on the key areas you have highlighted in the questionnaire and deliver a comprehensive report, including actions that need to be taken with instructions on how to go about making the changes. 3. Then there is two weeks of unlimited email contact to assist you in implementing the Blog Boost Report. I filled in the questionnaire and emailed it to Nicole, excited about Blog Boost but nervous at the same time. What if the recommendations were beyond my limited technical ability? Worse still, what if I didn't understand what was recommended, had no idea how to begin implementing the suggestions? What if Nicole recommended something I did understand but totally did not want to do? The first words in my report allayed my fears instantly. Nicole offered support, both moral and practical. I needed both! Nicole pointed out some things I knew already slowed my blog loading time down, but did not want to relinquish. She presented the facts, made suggestions, the rest was up to me. Figuring it was past time, I bit the Blog Boost bullet, removed my beloved widgets and tweaked other things. Result: even I can see the blog loads faster. She also explained how to make Google work in my favour. Like most bloggers, I know a little about search engine optimization, and how important it is. I'd run programs through my blog to assess its effectiveness and been told to increase SEO. But for the first time, with Blog Boost, I found out HOW to do this, in terms specifically related to my blog. For instance, I already knew I was supposed to add alt text to images, but Blog Boost told me precisely HOW to do this, and do it to advantage my blog. Some of the things Nicole told me were not maximising my blog's potential, I already knew. So what made it different this time? I honestly think part of it was that Nicole inspired me to make changes because she told me HOW to make them. I knew she was only an email away if I struck trouble. Sadly, I am easily befuddled, but Nicole didn't hesitate to answer questions and provide help. 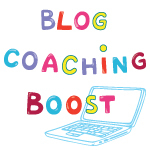 It was like having my own blogging genie in a Blog Boost bottle! Clear as crystal communication is important to me in my own writing, and I admire it in someone else's. Nicole set recommendations out clearly and concisely, then explained them step by step. In the past when people used acronyms, and terms like "long tail keywords", I had just given up. Nicole's explanations made sense, were short, then she moved quickly on to what I wanted to know: why it was important to me AND what I could do about it. So is Blog Boost a magic bullet? I've been looking for magic bullets my whole life, yet somehow it seems the worthwhile things are those we must work for. Blog Boost needs you to be motivated and prepared to follow its suggestions with real work on your blog. After that, the magic starts. I've had a 26% increase in page views to The Book Chook over 3 months. And that's just the beginning. I don't run my blog as a business. But I have a passion for children's literacy, literature and learning, and I want to share my passion with as wide an audience as possible. Because of Blog Boost, I now know how to take my blog to the next level. It's exciting! In conjunction with today's review, Nicole Avery of Blog Boost is making a special offer to The Book Chook readers. If you enter the code "bookchook" when ordering, you'll get $50 off the normal price of Blog Boost. That offer lasts until the end of June.